Inventory We are a resale marketplace, not a box office or venue. Ticket prices may exceed face value. This site is not owned by Rupp Arena . 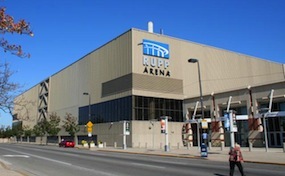 Rupp Arena is an arena located in downtown Lexington, Kentucky, U.S. Since its opening in 1976, it has been the centerpiece of Lexington Center, a convention and shopping facility owned by an arm of the Lexington-Fayette Urban County Government, and serves as home court to the University of Kentucky men's basketball program. With an official capacity of 23,500, it is the largest arena built specifically for basketball in the United States. In Rupp Arena, the Kentucky Wildcats men's basketball team annually leads the nation in college basketball attendance. The arena is also host to many concerts, conventions, and shows on a regular basis. Officially the arena has space for 23,500 spectators but has been known to cram over 24,000 inside for University of Kentucky basketball games. The facility is unique in the fact that it has no luxury suites, it only has backed seating and bleachers. The only upgrades to the facility have been video boards, new locker rooms, and updated seating. Arena Lexington not the official website for the Rupp Arena and has no affiliation with the Rupp Arena. ArenaLexington.com is not a primary vendor, supplier, or affiliated with any official website. We proudly provide access to a great selection for all secondary market events online. Ticket prices may be well below or above face value and will fluctuate with demand. To purchase tickets for all Arena Lexington Events simply click on the show of interest or call our operators at anytime.